13 oz Stainless Steel Funnel - 5" Top Dia. x 5-3/8"H | U.S. Plastic Corp. 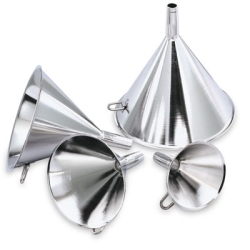 Available in sizes to meet every need, these durable, dent resistant stainless steel funnels are easy to clean. Hanging rings and capacity markings make storage and selection easier. Vent diameter is 11/16".